Fact: Students eat a lot of pasta. Yes it's one of those myths about student life that turns out to be true in the majority of cases. It is just about possible to go from absolutely no cooking experience to fending for yourself if you're armed with enough baking potatoes, packets of pasta and sauces. Even the most culinary challenged of undergraduates can manage to boil a kettle and throw a few spaghetti strands in a pan. However, pasta doesn't have to mean a jar of cheap tomato sauce and value-range penne. As the mainstay of the Italian diet, it comes in many guises and is just as likely to be seen on the menus of the classiest restaurants as it is in halls of residence. With just a little know-how you can create your own quick and easy pasta sauces and save yourself money, as well as (hopefully) tucking into a sauce that tastes superior to anything you pour out of a jar. 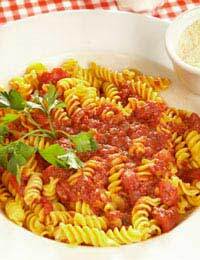 Pasta sauces tend to generally be either tomato- or cream-based, obviously with a number of variations in between. You can either use canned tomatoes (plum or chopped) or fresh. Passata (sieved tomatoes) is handy to keep in stock and tomato purée is an absolute essential. Mascarpone, cream cheese and feta will all come in useful and, of course, Parmesan to grate over the finished dish. If there's a choice always opt for fresh herbs, as the flavour is so much better. Basil is a classic ingredient in a number of sauces and if you're a keen cook you should consider saving money and growing your own - you don't need a garden; a window box will do the trick. Thyme and oregano are also widely used. Olives are great for adding flavour to all kinds of sauces, while sun-dried tomatoes will really jazz up a tomato sauce. You can buy these in packets or jars - either is fine. Fresh chillies will add a kick if you want to turn up the heat and garlic is welcome in pretty much any sauce you can think of. These flavours work very well together. This will serve 2-3 people. add 2 chopped garlic cloves and fry until softened. Pour in two cans of chopped tomatoes and stir. Cook this for about 30 minutes. Roughly chop a handful of basil leaves and add most of them to the pan. Season with salt and pepper and sprinkle the remaining basil over the finished plates. add a chopped garlic clove and fry for a minute or two. Add four or five chopped, sun-dried tomatoes and 1 tub of crème fraiche. Drain and remove any skin or bones from a small can of salmon and add this to the pan. Allow to simmer very gently for about 5 minutes. Serve with fettuccine or penne. Fry a chopped onion and a chopped celery stick in olive oil until softened. Add a finely chopped carrot. Add 500g of minced beef and cook until it has browned. Add a can of chopped tomatoes, half a can of water, a large dash of red wine and a good pinch of dried thyme and oregano. Bring to a simmer, cover the pan and cook for about 45 mintues, until the sauce has reduced. Hopefully these ideas will get your creative juices running. All sauces are adaptable so add and subtract at will, depending on what you like. I did the salmon pasta for my husband and he loved it.He wants me to do it again this week and serve it with a salad and crusty bread.